From rebuilt mosques to new oil contracts, Russian firms are cashing in as the Assad regime gains the upper hand in Syria. Waer district, Homs, after rebel fighters evacuate in May 2017. (c) Omar Sanadiki/Reuters/PA Images. All rights reserved.Over the past eight months, Russia has increasingly seized the initiative in charting the political and military course of events in Syria. With the United States focused on the fight against Islamic State in Raqqa, Moscow has engineered, with Ankara’s cooperation, a number of “de-escalation zones” in the country, covering the four primary areas of regime-rebel contact. At the same time, Russia has loudly trumpeted the rebuilding of several prominent mosques in Syria as flagship projects aimed at demonstrating its benevolent intentions. Recently-uncovered documents have also revealed that Russian firms have made major strides in securing economic boons for the immediate postwar period. Despite this, the Kremlin continues to face profound issues in projecting its influence across regime-held Syria, a problem that demands ever-growing resources even as major combat in the country declines. 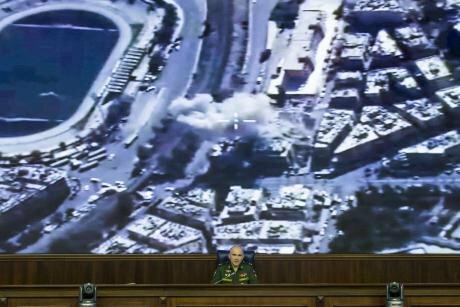 Russia is significantly expanding its forces in Syria. In contrast to announcements of success and subsequent withdrawal made by Vladimir Putin in March 2016 and January 2017, Russia continues to deploy ever-more ground troops to Syria. Around the time of the latest round of international negotiations in Astana in early July, Moscow spent roughly a month reconstituting and preparing its new ranks of military police destined for Syria, with no reliable reports of these units emerging for most of July. Suddenly, 24 July saw a flurry of activity, beginning with the deployment of roughly 400 Russian personnel to the Daraa de-escalation zone in southwest Syria, where they set up two checkpoints and ten observation posts near the Israeli-controlled Golan Heights. The next day, video emerged of a Russian checkpoint operating in East Ghouta, establishing a Russian ground presence in the second of four de-escalation zones in the country. On 26 July, Russian Defence Minister Sergei Shoigu confirmed a major development, stating that Russia presently had four military police battalions operating in Syria, eclipsing the previous total of two to three such units. Shoigu also stated that these battalions were from Russia’s Southern Military District, a region which includes the North Caucasus, thus indicating the Sunni Muslim composition of most or all of the units. This marked growth shows Moscow’s seriousness in implementing its painstakingly-negotiated ceasefire regimes in western Syria. 25 July: Russian military police reported to man checkpoint in East Ghouta, an outlying district of Damascus. Source: TV Center.Further developments along the western front occurred in early August. On 3 August, Russian military police established two checkpoints north of Homs city to enforce that province’s ceasefire regime. By 10 August, these checkpoints were running at full capacity, enough to invite numerous Russian journalists to inspect the area. While a framework for Idlib province has yet to be established, three of Syria’s four de-escalation zones now have a Russian ground presence and are functioning to various degrees. Freezing the situation along rebel-regime frontlines in western Syria has allowed Russian assets to aid with a push towards their new military objective — securing oil and gas resources in the country’s east. Syrian government forces have advanced against the Islamic State in recent weeks, looking to secure outlying desert areas and relieve the four-year siege imposed on the eastern city of Deir Ezzor. While there is no hard evidence of Russian advisors in this push, numerous Russian reporters are embedded alongside regime forces, stationed on the frontlines in the recently-captured town of Sukhna. Russian aerial assets have also supported this offensive, shifting since 9 July to focus on Islamic State territory near Sukhna and along the Euphrates River. These efforts dovetail with recently-revealed economic interests secured by Russia in the area. While Russian political and military efforts aid Assad in stabilising frontlines and reclaiming ground around the country, Moscow is also increasingly claiming economic benefits in Syria. The first signs of potential profits emerged in October 2015, when a Russian delegation visiting Damascus announced that Russian companies would lead Syria’s postwar reconstruction. From these negotiations emerged a pair April 2016 deals worth at least €850m total. While the full details of these were not made public, Syrian Prime Minister Wael al-Halqi implied that more agreements were also in the offing. A further Russian parliamentary visit to Syria in November 2016 resulted in Syrian Foreign Minister Walid Muallem reportedly offering Russia firms priority in rebuilding Syria. Leading Russia’s reconstruction efforts in Syria is a seemingly unusual actor: the restive North Caucasus republic of Chechnya. The Chechen government is financing some of Moscow’s most prestigious projects in the country, most notably the rebuilding of Aleppo’s prominent Ummayad Mosque at a cost of $15m. The Akhmat Kadyrov Foundation, named in honour of Chechen leader Ramzan Kadyrov’s late father, is also rebuilding the Khalid ibn Walid mosque in Homs. Chechnya has become a key player in Moscow’s outreach efforts to the Sunni Muslim world in recent years. By allowing Grozny and Kadyrov to spearhead activity in Syria, the Kremlin hopes to win back some of its legitimacy among Syria’s majority-Sunni population. 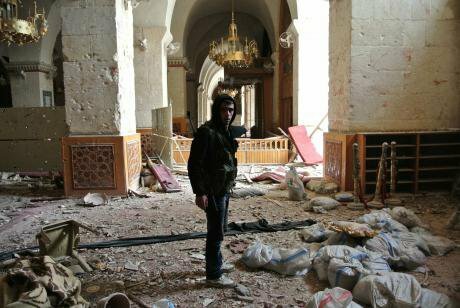 March 2013: Free Syrian Army "Al Tawhid" brigade patrols in the old market and the Umayyad Mosque. (c) Abd Rabbo Ammar/ABACA/PA Images. All rights reserved.The most significant Russian economic coup to date came in the form of an agreement revealed by the St Petersburg daily Fontanka in June 2017. According to documents recovered by the outlet, in December 2016 an agreement was concluded between Syrian Oil and Gas Minister Ali Ghanem and a Russian firm under the auspices of the Russian Ministry of Energy. This agreement allegedly awarded 25% of Syria’s entire oil and gas production to Russian firm Stroitransgaz, which was entrusted with providing services regarding the “defence, production and transportation” from the fields in eastern Syria. Another Russian firm involved with these dealings, EuroPolis, is closely linked to both Stroitransgaz head Evgeny Prigozhin, himself a close Putin ally, and Dmitry Utkin, the leader of the well-known Russian private military contractor Wagner. With an estimated 2,500 Wagner personnel in Syria, the group seems likely to carry out security duties for Stroitransgaz-operated wells in the country’s centre and east, including participation in the ongoing offensive from Palmyra to Deir Ezzor. Maxim Suchkov, the editor of Al-Monitor’s Russia-MidEast Pulse, urged caution over judging these recent deals as a decisive victory for Russia in Syria’s economic environment, as Fontanka is prone to “overstretch[ing] things.” Nevertheless, Suchkov emphasised, via email, the interests held by Moscow regarding Syria’s oil sector and their willingness to utilise PMCs to safeguard Russian firms operating in the country, a tactic which allows a degree of political insulation for the Russian government for any potential casualties incurred. 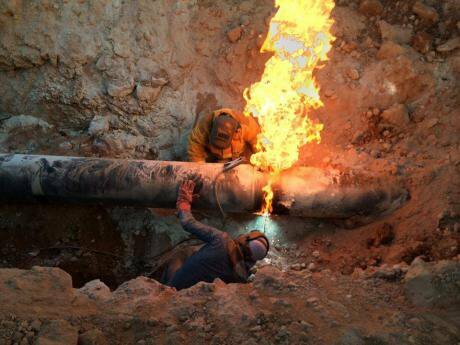 Source: Syrian Ministry of Oil and Mineral Resources. Beyond the east, the most complicated issue facing Russia in Syria presently lies in the country’s northwest. Russia is currently seeking to determine, alongside Turkey, the plans for a much more ambitious de-escalation zone in Idlib province, which will likely require far more than the 1,000 or so military police previously deployed by Moscow. Idlib, which constitutes the most formidable remaining opposition stronghold, with tens of thousands of rebel fighters, presents a far greater challenge than Homs, East Ghouta or southwest Syria. For this reason, Moscow is seeking additional manpower and political buy-in not only from Ankara, but from a number of Central Asian capitals as well. Despite Russian successes in capturing territory and enforcing ceasefires, all is not well with Moscow’s campaign in Syria. Attempts to secure international peacekeepers reflect the difficulties the Kremlin faces in enacting leverage over its erstwhile Syrian and Iranian allies, who continue to pursue their own goals regardless of international agreements brokered by Moscow that would ostensibly constrain their actions. Russia currently has its highest number of personnel in Syria to date, despite combat being at a relative low compared to the large-scale battles fought in Aleppo and elsewhere since Russia’s September 2015 intervention. Iran, in particular, has proven problematic. Maxim Suchkov mentions that Tehran is increasingly upset by Russia’s deals with the opposition, Turkey, Jordan, Israel and the US, which it sees as being made “behind their back”. October 2016: Lt. Gen. Sergei Rudskoi of the Russian military's General Staff speaks at a briefing at the Russian Defense Ministry's headquarters in Moscow. (c) Ivan Sekretarev AP/Press Association Images. All rights reserved.Russian-Iranian disagreements over how to conclude the battle for Aleppo in December 2016 were the catalyst for the initial insertion of Chechen military police into the country that same month. The inverse relationship between Russia’s increase in personnel deployed to Syria and the intensity of conflict in the country, while seemingly paradoxical, is in fact a measure of the scale of resources Moscow must deploy in order to secure its political objectives: a drawdown and resolution of the ongoing conflict. Amid these increased deployments, regional media has halted coverage of the matter. North Caucasian media sources and officials have gone completely silent on this latest round of deployments, in stark contrast to the intimate documentary coverage and triumphant medal ceremonies that accompanied the initial military police campaign. The last specific mention of the Chechen military police battalions deployed to Syria came as the second rotation of these units returned home on 24 June. Ingush soldiers likewise have been absent from media discussion since finishing their first deployment around 5 June. This could indicate that the Kremlin, realising the contradiction between its narrative of “victory over terrorism” in Syria and its increasingly widespread ground presence, is wary of drawing further public attention to these growing deployments and the subsequent risks these carry. While the regional governments of the North Caucasus may be happy to send soldiers to Syria, their populations, themselves Sunni Muslims, are significantly more averse to potential deaths incurred while fighting their coreligionists far beyond Russia’s borders. 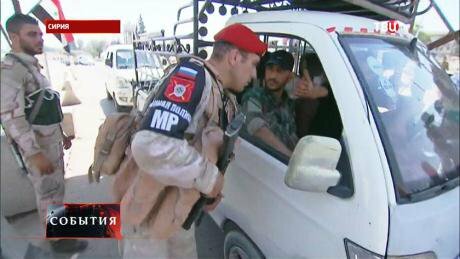 More ethnic Russian soldiers may also be involved in the presently-active battalions, a fact belied by interviews with military police officers in Syria bearing such names as Vitaliy Afanasiev. Whatever the case, discussion of these units in the North Caucasus has been reduced to social media rumours. Even beyond these issues, Russia faces a far more daunting and fundamental task as it attempts to maneuver itself as the dominant actor in Syria: rebuilding the shattered Syrian state’s authority. Russia has not yet sought to seriously improve governance in recaptured areas, as doing so would necessitate an even greater number of ground forces than it presently has in Syria. 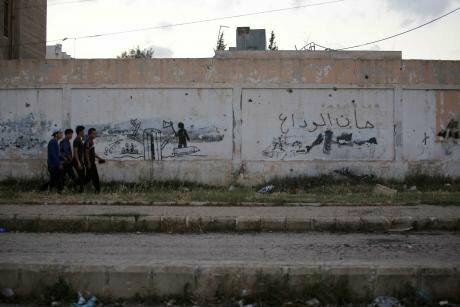 Analysts have long noted the increasing breakdown of the Syrian state, as local governance and security functions are largely outsourced to militias outside the control of the state. Russia’s efforts, however, have so far stopped short of restraining pro-Assad Syrian militias and Iranian-backed foreign armed groups from ruling through extrajudicial thuggery in reclaimed areas. Reports of abuses by pro-regime militias in Aleppo since its return to government control have highlighted that the posting of several hundred Chechen military police there in early 2017 changed little. More worryingly, Moscow appears either unwilling or unable to engage with and bring to heel various autonomous actors wielding power in government-held regions of Syria. Russia is largely attempting to deal with Syrian state structures and institutions, while ignoring (either willfully or via ignorance) that the country is de facto a patchwork of fiefdoms controlled by local elites and warlords. Moscow will thus face major difficulties in reaping the rewards of its lucrative reconstruction efforts, which are likely to be challenged by local actors and elites enforcing their influence. Even the presence of several thousand military police will likely prove insufficient for exerting control, with Iranian-backed and autonomous pro-regime formations retaining effective control of nearly the entirety of government-held territory in Syria. Moving forward, Russia’s focus is likely to continue to remain on the Astana process and its initiatives. Maxim Suchkov notes that Russian Deputy Foreign Minister Mikhail Bogdanov, the Kremlin’s point man on Middle East issues, is presently attempting to engineer unity among Syrian rebel groups and acceptance among them of the de-escalation zones. Andrey Kortunov believes that Moscow will focus heavily on further engaging the US in the Astana talks, adding further legitimacy and international consensus, while also seeking to continue to defuse conflict in the country. While these goals may be realistic, Russia continues to face wide-ranging problems regarding the construction of true stability in Syria, and will likely be drawn ever further into ground-level engagement in the country. As its diplomatic efforts progress, expect to see more Russian soldiers and military police in Syria in the coming months.